Not recommended for very snowy areas; traction and braking are terrible. Often lose traction when it's simply rainy. Would not buy again. Really like this tire. Handles great in all seasons (dry, wet, snow and ice) with the AWD. This set lasted 60K+ miles and is only now starting to loose cornering traction due to worn edges. Highly recommended. Awesome tire, good grip in snow, rain or dry!!! This tire flat spots easily. There is constant vibration because of this. Under 90kmh it's fine. Over 100kmh it must be driven more than 30km for the flatspot to go away. Since my work drive is all highway I would never buy this tire again. Stay away. Dry grip is excellent. 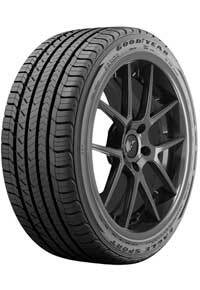 I have several different brands of tires for the Mustang, and without a shadow of doubt, the Goodyear tire has been wearing better and providing a much softer ride for my wife while not having any drop off in performance. Best darn tire I've ever bought. These tires replace the Eagle GT tires I had previously. They were great during the snowy winter we had in MD this year. I could feel the control on the slushy and icy roads. I love the traction in the rain and the wet weather. The car is very responsive when I am driving in high traffic areas and works really well when I am driving the back roads to get to some remote destination. I would absolutely buy these tires again. They perform above my expectations in all conditions and keep the car fun to drive. I've had these tires on for 13,000 miles now. They have done great in the rain, and now I have tested them in the Illinois snow and I'm very pleased with them! For an ultra high performance tire, you cant go wrong with these! Tread wear seems to be great still. It's also a great looking tire and I have received many compliments on them! Very happy! i replaced these tires when my car had 28,000 miles. They still had plenty of tread but I didn't want to chance going through another day with these on it. I hydroplaned and they are not good in the winter at all. Granted my Touring Package came with 19's. Hope this helps you. Goodyear has always been the tire for me. My grandfather loves Goodyear, my aunties, my mother... so its kinda like a family tire. We love Goodyear. Goodyear is the king of tires. If i had rule of the world, every one would have Goodyear on their vehicle.